Posture is a trivial thing my mother used to pester me about only so that I would look presentable. Actually, posture is key to optimal health. Just as a building needs a solid foundation and structure to remain strong in wind, rain, and earthquakes, so does your body. Proper alignment of the organs, bones, and muscles improves circulation and breathing, boosts the nervous system, supports organ function, promotes muscle relaxation and stress reduction, enhances athletic performance, reduces risk of injury, and accelerates healing from injury. 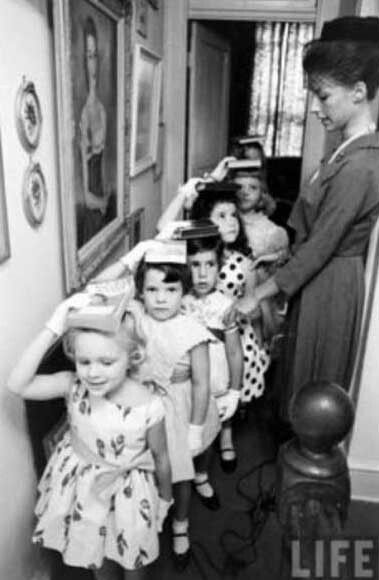 These young girls are getting an early start on learning posture to improve their appearance. Good posture is also key to optimal health. Read more about The 'Myth' of Good Posture — REALLY? !